These videos and this book should be required for all Cru staff. Cru just released (June 2017) a 5 part video series (you can watch them below) on the History of Cru (They’re not exactly going viral – only 49 people have watched them!). As a staff member, they’re really fun to watch, and a reminder of how greatly God has used Cru to bring millions to know Him. We truly stand on the shoulders of giants. 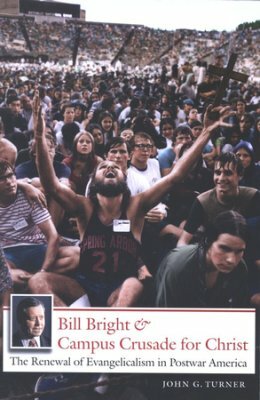 Developing the personal support raising model that is widely used by all missions organizations – “In an era of falling church investment in evangelism, Bill Bright pioneered the individual missionary support model, which seeks commitments from 50 to 100 individuals to give regular monthly amounts.” Now, there is some debate on whether this was good or bad. And obviously it’s not the ONLY way. But it radically widened the bottleneck for laborers. You can only send out as many laborers as you can salary. And central fund raising severely choked the laborer pipeline. And Bill Bright’s innovation enabled hundreds of thousands of laborers to GO. If you’re on support, you may not be the biggest fan of MPD, but consider this – Cru staff made $100 a MONTH before Dr. Bright innovated the personal support raising model! Which do you prefer? The rapid spread of the gospel through the Global South via the JESUS Film. Aside from the aggressive translation of the Bible by Wycliffe, I can’t think anything else that has so greatly multiplied the reach of the gospel. The renewed focus on evangelism in the 20th century= Cru + Billy Graham. Billy Graham brought a crusade/event driven evangelism. Cru brought training in personal evangelism. Using culturally relevant means to share the gospel (as opposed to the cloistered fundamentalism that was the dominant form of evangelicalism). Cru was widely criticized for their open stance to the culture. America was greatly altered by this. Millions of churches being planted across the U.S. and around the world. Case in point – Cru played an ENORMOUS part in shaping my state of Arkansas. Fellowship Little Rock and Fellowship Northwest Arkansas are two of THE most effective, large, and fruitful churches in the state. Both were started by former Cru staff and students who graduated from college and longed to replicate what they had experienced in Cru – aggressive evangelism and discipleship – in a church. So they started those churches. Not to mention the incredible impact an Arkansas Cru grad, Dennis Rainey, has had on our state/nation/world through founding Family Life Ministries. That’s not to mention the number of Cru alumni who went on to seminary to become pastors- I heard the story once that in the late 1970’s at Dallas Theological Seminary, someone conducted an informal survey in his first year Greek class of 40-some students, “How many of you here either came to Christ, or were discipled through the ministry of Campus Crusade for Christ?” Every hand (except for one) was raised. Bill Bright and Campus Crusade for Christ: The Renewal of Evangelicalism in Postwar America. The author set out (for his doctoral dissertation) to find the roots of the rise of American Evangelicalism in the latter half of the 20th century. He was not familiar with Cru but in his research he began to see what a critical role Cru played in the surge of Evangelicalism. So he gives an (what I thought was very) objective history of Cru (warts and all). On the less objective side (but nonetheless excellent and well worth watching!) – these five 20-minute videos do a great job of summarizing the history of Cru. Very inspiring. We stand on the shoulders of giants – men and women who have creatively, boldly, and passionately shared the gospel with millions of people. There’s much work to be done. It’s a privilege to take the baton from them to continue the work. looking forward to watching the videos. the book you mentioned was great, very objective listing Dr. Brights strengths and weaknesses, victories and defeats. He will always be one of my heroes. i think about him and the way he lived his life alot. Hey Tim, this book looks really interesting. I just ordered it. It’s cool to think how much of a role Cru played in my life and my parents! I remember always asking my parents what that ‘Explo 72’ bumper sticker was on the back of my dad’s van. And they told me about how they drove from Seattle to Dallas for their ‘honeymoon’ with a group of college students from our church! Thanks for your post… I’m looking forward to checking out the videos too! Glory to God Almighty. CCCI is my ministry, i’ve se en powerful Hand of Lord through It. Now I’m evangelist in DRCongo. Thanks for sharing these links Tim. There is something wrong with the first video. Could you edit the post with the correct link for the first video? Thanks for the heads up – apparently they scrapped version 1 and replaced it with an updated version!